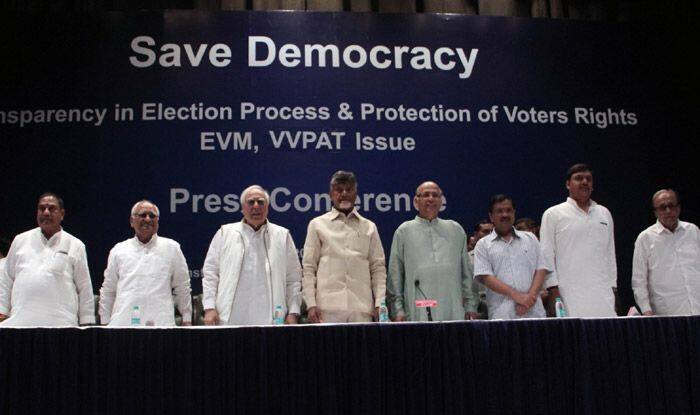 Naidu was speaking at a meeting organised by opposition parties at Constitution Club of India on the topic 'Save democracy - Transparency in election process and protection of voters rights'. Andhra Pradesh Chief Minister N. Chandrababu Naidu on Sunday that his fight for replacing EVMs with ballot papers is to protect democracy in India. Naidu, also the Telugu Desam Party (TDP) chief, claimed that only 18 out of 191 countries were using Electronic Voting Machines (EVMs) for conducting the polls. He reiterated that the machines can be manipulated and that even the developed countries were not using them.